There's a lot of pressure when you put the definite article the in front of anything. You're suggesting that yours is the one and only, the end all be all, the real deal. Such is the case with Ithai Schori and Chris Taylor's hamburger recipe from Twenty Dinners. They claim that they, in fact, have The Hamburger Recipe. I'll let you determine this for yourself. But it is worth the experiment. The somewhat fatty meat lends moisture. The bourbon lends noticeable and welcome sweetness. The jalapeno gives a little heat and pop. The sheer quantity of onions guarantees super juiciness. 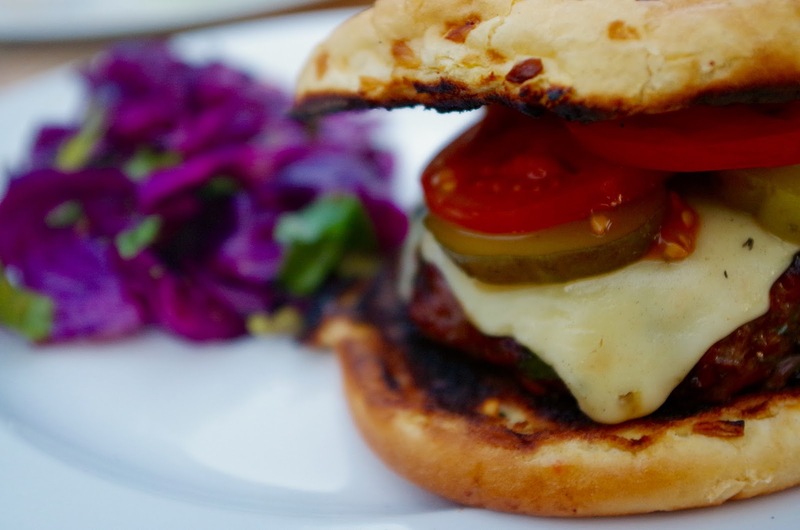 This is a nice change of pace from your everyday hamburger. Seriously, you want to give this a try, don't you? 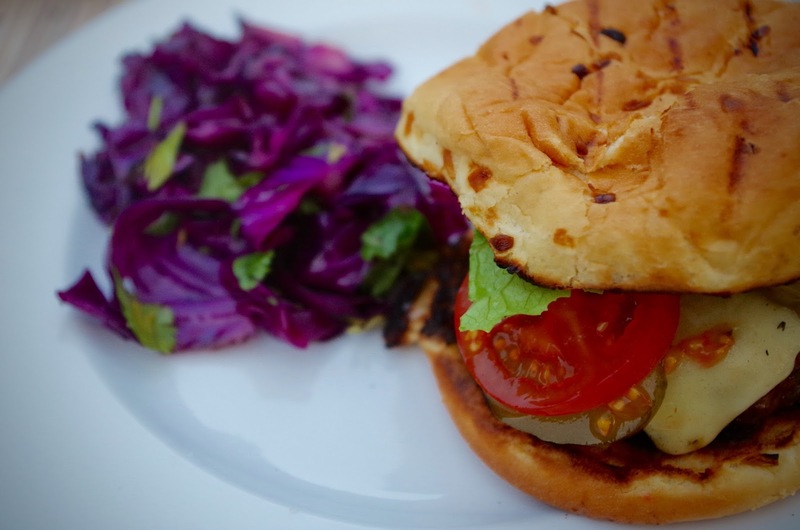 Pile with grilled red cabbage (or heap it on the side, as I did), and you have a real burger. The slaw was perhaps is a little oily for my taste--you might cut a little of the oil yourself, but the recipe below maintains the recommended oil (as I haven't done any further experiments yet to determine how little you need). However, by smacking a quarter of a head of cabbage onto a grill before making a slaw, you're guaranteeing a smoky, succulent companion for an already smashing burger. Maybe this is The slaw to have in the summer months as well. As a final note, Norooz, the Persian New Year, passed about six weeks ago (which is also an indication of just how long the delay between pictures and post actually is on this here site. Sorry.). 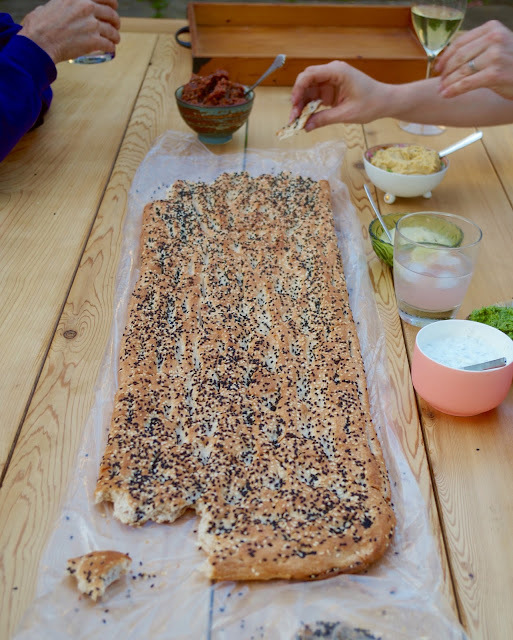 A co-worker of mine gifted me and others this gorgeous Barbari bread. Before we had the hamburger, the husband's parents, the husband, and I, we all feasted on bread before we began dinner. It was lovely. I am going to admit it--I used Google here: سال نو مبارک. 1. In a bowl, combine beef, onion, garlic, and jalapeno with the bourbon and Worcestershire sauce. (Depending on how much spice you want, you can use more or less of the jalapeno.) Let the mixture marinate, at least 20 minutes, while you prep other ingredients, including your grill, for your meal. 2. Add the parsley and peeper to the meat mixture and combine well. Try a pinch of the meat and adjust the seasoning to taste. Divide the meat into 6 balls, and gently form them into patties. 3. Once the grill is very hot, use your grill brush to scour off any bits from the grate. Roll up a dish towel, coat it lightly with oil, and rub it along the grate so that your food doesn't stick. 4. Salt one side of the meat. Place the patties salt side down on the grill and let cook for 4 minutes with the lid open. After 4 minutes, salt the tops of the burger, and then flip the patties over. Continue to cook for another 3-5 minutes or until they are done to your preference. You can tell by touching the patty--if it gives easily and it's soft, it's still rare. Once you feel a little resistance, it's medium rare. Firmer than that is getting into medium and then well-done territory. 5. 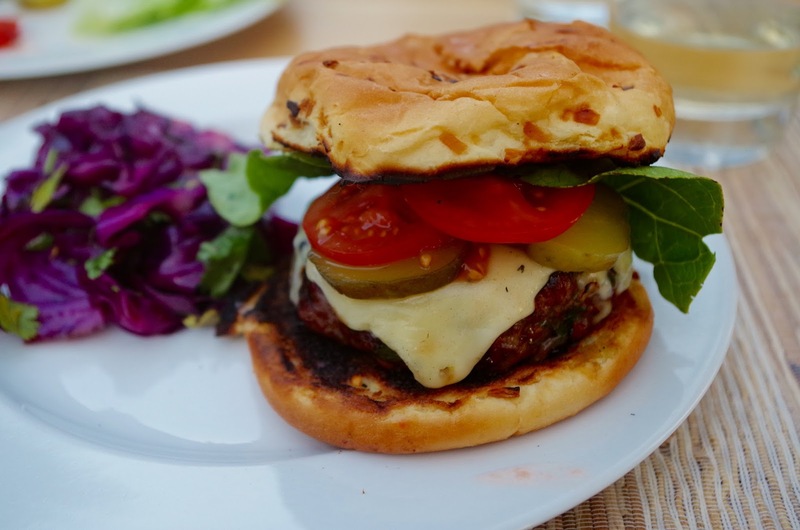 Grill some buns and layer the patties with your toppings of choice. * Would 1/2 cup be enough? You tell me. 1. In a large bowl, mix together the oil, vinegar, soy sauce, ginger, and garlic. Trim the root of the cabbage, quarter it (or cut into 6 wedges if it is very large), and put in a large bowl. Pour the oil mixture over the cabbage wedges and let it marinate for at least 1 hour at room temperature. 2. Preheat the grill until very hot. Remove the cabbage wedges and tap against the bowl to shake off the marinade. Throw the cabbage down on the grill, avoiding the center--the hottest part of the grill. Reserve the marinade to use as a dressing for after the cabbage is cooked. Close the lid of the frill and allow the cabbage to roast. After 7 minutes, flip the pieces, and cover. Cook for another 7 minutes. Now move the wedges to the center of the frill to blacken, turning every couple of minutes so it doesn't burn to a crisp. 3. The outermost leaves will start to peel away. Pull them off until all of the layers have seared and have blackened slightly. 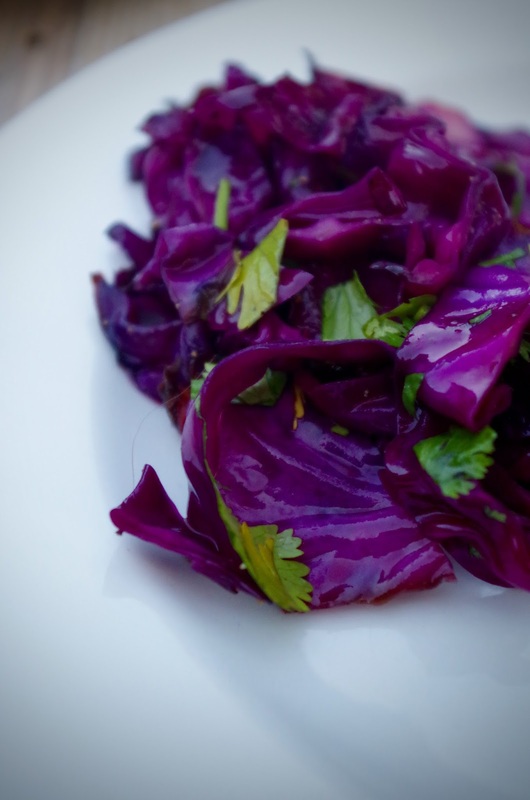 Chop all the cabbage into thin strips, toss with the dressing to taste, add cilantro, and serve. Spring Salad with Halloumi from Honey & Co.